Do you have garden waste you need to get rid of, but are unsure of how to transport it off your property to a suitable site? If so, Lightning Skips is here to help. For over a year we have offered reliable Brisbane skip bin hire in Brisbane and the surrounding area. What is a skip bin? Put simply; it is a large metal bin that you can use to discard of refuse such as leaves, dirt, and lumber. The ones we have for hire in Brisbane vary in size from 2 to 8 cubic metres, so you can trust that we will have a receptacle that is right for you. Our bins are clean and fresh because we want you to know that we care about our products. When you hire skip from Lightning Skips in Brisbane, you are getting an excellent service. Not only will we consult with you for the best delivery time, but we will also be sure to be punctual. Our biggest concern is your satisfaction, and we know you do not want to waste time waiting for us to arrive where you want us. We can arrive within 24 hours, and even offer same day delivery if you place your order early in the day. We also haul every skip bin you hire from us in the Brisbane region away at no additional cost. All our prices are fixed so you never have to worry about getting hit by surprise fees. If you want to hire a skip bin in Brisbane from a reliable company, call Lightning Skips today. We are waiting to take your order. Whether you are looking to clean up a commercial or residential property, you will need some place to put your rubbish, and that is where Lightning Skips enters the equation. We are a valued skip bin hire business in Brisbane, and we have what you need. Our containers come in different sizes to meet your requirements. Only have a little trash to throw out? We can help. Have lots of refuse to dispose of – you can hire a skip bin for that, too. We are here to serve Brisbane. Our receptacles are sturdy, so you do not have to worry about overloading them, and when we deliver one, we will place it where you prefer. Our job is to make your job easier, and we make every effort possible to do our job right. To hire a skip in Brisbane, place an order with Lightning Skips. We are happy to help you clean up. 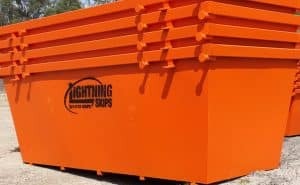 Lightning Skips offers skip bin hire in Brisbane at set prices you can afford. We offer you the best rates and fantastic service because we want you to consider us every time you need waste disposal. We pride ourselves on excellent customer service and are always willing to answer any questions you have about our operation. Lightning Skips is fast, reliable, and here to serve. Reach out to us when you need to hire a skip in Brisbane. We are happy to hear from our customers on 0472 975 477, or through our online booking form that you can find on our homepage.